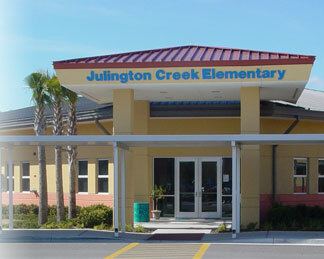 J ulington Creek Elementary, founded in 1972, serves the northwest corner of St. Johns County, Florida. We serve approximately 1,000 students in kindergarten through fifth grades. The faculty and staff of Julington Creek Elementary are dedicated to providing a challenging and rigorous curriculum for all of our students in a nurturing and safe environment. In addition to the cadre of excellent classroom teachers, Julington Creek offers specialist education in Art, Music, Media, Physical Education, Computer, Speech and Language Development, and Exceptional Student Resources. We facilitate the growth of our students socially and emotionally, as well as academically. Our principal, Mrs. Jeanette Murphy, is committed to working with our students, parents, and teachers to maintain our “learning legacy” and long tradition of academic excellence. There is active parent support of our school through PTO, School Advisory Council, and a very busy group of community and parent volunteers. On-site Extended Day Care is available before and after school for working parents. Julington Creek School takes pride in inspiring young minds. If you wish to contact a teacher via e-mail, you can find their address in the staff directory. The St. Johns County School District will inspire in all students a passion for lifelong learning, creating educated and caring contributors to the world. JCE…where children grow to be well-rounded people of character, innovative and college/career ready. We support and recognize each other with dignity and respect. Professionalism is the cornerstone of our practice. We affirm our strengths while working on our weaknesses. Constructive criticism, balanced with genuine concern and affirmation. We maintain high expectations. To maintain high expectations through encouragement, modeling, and positive behavior. We all grow from our mistakes and are willing to accept change. We accept that personal growth is a learning process that involves mistakes, failures, consequences and change. We use humor and laugh with each other. We will laugh with each other, yet never use it as a weapon. We embrace active learning because we are active learners. We strive to be active learners through individual responsibility toward our own learning activities and fostering them in our students. We always keep sight of the Big Picture. Because we recognize the Big Picture as a growing 3-D puzzle that is never ending. We acknowledge the presence of others, if simply with a smile. We recognize that each person is an integral, vital, valuable part of Julington Creek Elementary School and treat them with respect. We maintain a safe and caring environment. We establish fair limits and boundaries that allow everyone to feel safe. Our decisions are based on what is best for the development of our students. The bottom line is – our students are our top priority.